As a shed-star, Azrael’s appearance is reflective of the night sky, and specifically, the aurora borealis. He is a tall and well-muscled stallion, with a broad chest and long, strong legs. His coat is a dappled sort of roan, with shades of black and silver colliding in a manner reminiscent of a cloudy night’s sky. Dark points accent his legs and face, and a dorsal stripe of iridescent blue and turquoise stretches from the crown of his neck down his rump. He has an iridescence swath of turquoise and purple along his neck and dorsal stripe, which glows softly in the night. Azrael’s mane and tail are long and dark – inky black with interspersed highlights of turquoise. The turquoise color is repeated in his eyes, a strange shade for shed-stars who usually bear silver-grey. They are the eyes of a priest who sees far more than he lets on – a priest who communes with the very stars in the night sky – knowing, seeking, holy. Still stranger, his very hooves are painted with a cyan hue, shining even in the darkest of nights with an eerie sheen. He is, in a word, an ethereal sort of beast – a true representation of his people – the people of light. Azrael is an ethereal sort of creature. He is not old, but seems almost timeless in the way he carries himself. Though he can come off as being a bit stoic, once he begins to talk with others, there is a hint of humor that can come out. He tends to be a bit reserved and introverted, not so much because he doesn’t like the company of others, but more because he is a creature who listens and observes the world around him – always keen to know more. These traits make him a skilled magician, astute and observant. Additionally, he is eager to speak of the lore of Novus, and eager to serve the night goddess Caligo. The stallion is kind, and his curiosity about the world easily draws others in. There is a light of intelligence in his eye, and confidence it the way he interacts with others. It can be said Azrael is something of an old soul, and he particularly enjoys lessons and accouterments from the past. In addition to his profession as a magician, Azrael can be considered artistic. He takes great pleasure in the beauty of the world around him, particularly in things which mirror the night sky that he loves so. It is said that in the beginning, the shed-stars came from the heavens, that they were blessed by the night goddess herself to wear the colors of the northern sky. They came in all shades and colors, reminiscent of ethereal stars, and Azrael is no exception. His appearance is one which has been passed down from many generations before him, and the stallion is quintessentially a star-watcher, worshiping the heavens and the deities of night with a fierce passion. Little is know of his individual history, only that he came to Novus with the others as the descended from the mountains. Azrael had no family to speak of, he is simply one of the people – one of the body of shed-star horses who came to the night court with little more than a curious sort of dream. He is not one to speak of his past, because Azrael is a humble sort of beast. Devoting his life to his craft, he does not easily give in to the pleasures of life, instead focusing on his work and his worship… but there is a kind and personable creature behind his mask of piety… it’s just difficult to scratch past it. He is a creature whose history is being written and rewritten every day. Unlike many of the other entertainers of the Night Court, it would be rare for Azrael to weave a clever story of his childhood or past. He takes a rather clinical mindset to his childhood – for he was born and raised in the herd, but did not maintain a strong bond or relationship with his mother. Instead, the stallion was raised in more of a communal setting, relying on the bond of the herd more than the bond to individuals. It is somewhat difficult for him now, branching out alone into Novus to forge a new path and assimilate into his new life at the Night Court. Azrael has passive magic, which allows for his body to emit a soft glow. 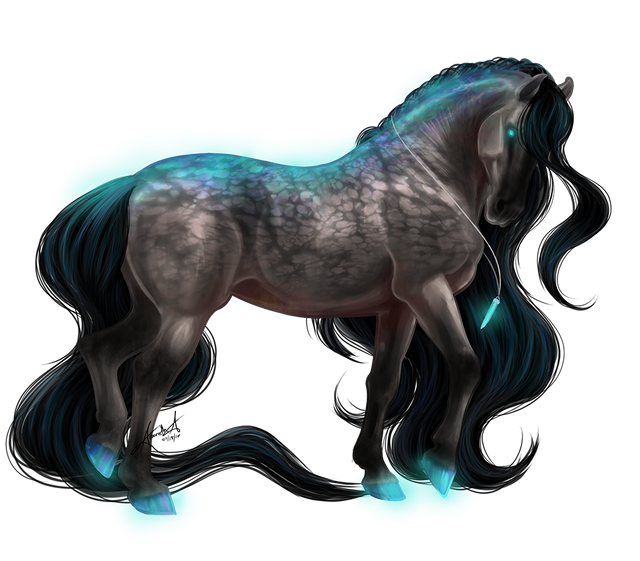 There is a glow along his neck and dorsal stripe, his turquoise eyes, and his turquoise hooves, reminiscent of the northern lights. Azrael wears and enchanted necklace of a smooth obelisk design, which glows with a turquoise light. Though he does not wield it often, Azrael carries a staff which is made of smooth onyx with silver inlay. At the top, it branches into a sort of dream-catcher, adorned with gemstones and sparkling bits of metallic fragments, giving it an appearance of stardust. It is more ornamental than truly functional as a weapon, though in a battle, it can be wielded much like a Bo Staff in martial arts.